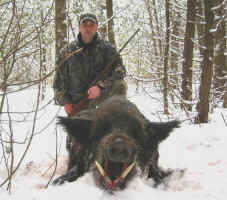 WildBoar Reserve provides a challenging hunting of true German wild boar that originates from the Black Forest, Germany. Wild boar have impressive thick coats with bristly outer guard hairs in colors from grayish black to golden brown and sometimes with the sprinkling of silver tipped hairs. They grow a thick woolly undercoat in order to survive the cold winter months. Both male and female wild boar grow ivory tusks although the males tusks grow bigger than the females. The upper tusks (called honors) sharpen the bottom tusks (appropriately called rippers) ready for battle. 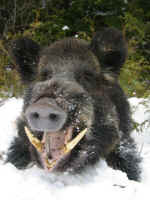 German wild boar grow to a maximum of about 250 lb. They spend most of their time foraging, rooting for food and fighting. Wild boar live in groups with a hierarchy system. 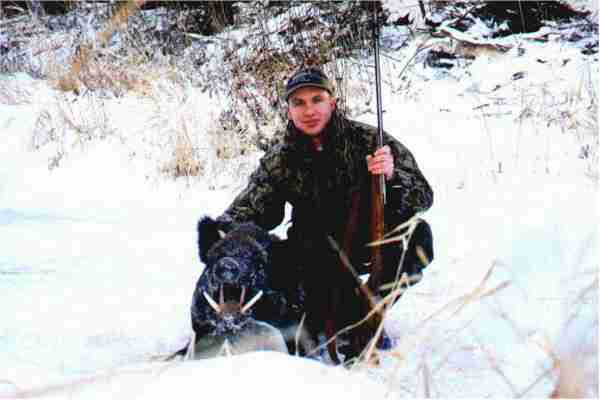 There are often battles when a young wild boar challenges the rank of his or her superior. Older male wild boar usually live solitary lives except during breeding season when they seek out a herd of female wild boar. A mature male develops an extra plate of hard cartilage over the shoulder area as protection against a challengers tusks. This shield can actually stop an arrow. A nocturnal animal in summer, wild boar are omnivorous, swift, and very good swimmers. They live in dense thickets - a cautious lifestyle since they are generally a prey animal. Their vision is poor but can smell a human 1/4 mile away.. upwind ;-) . A warning sound to others is their growling or snorting. When alarmed or angry their fur stands up on their shoulders and rump, they swing their tails, paw the ground, grind their tusks and snort. 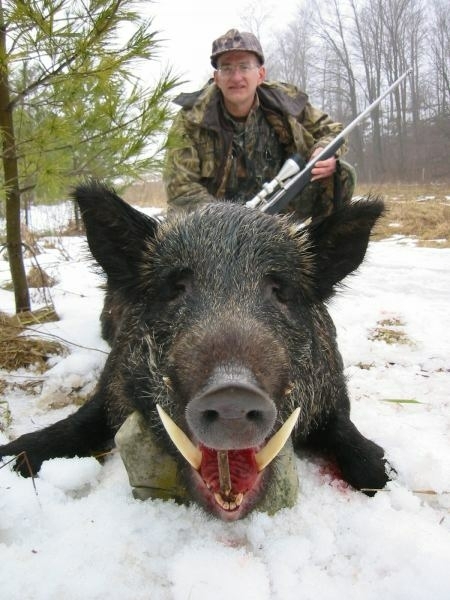 Wild boar are an excellent beast to hunt because of their strength, speed, intelligence, and ferocious fighting. 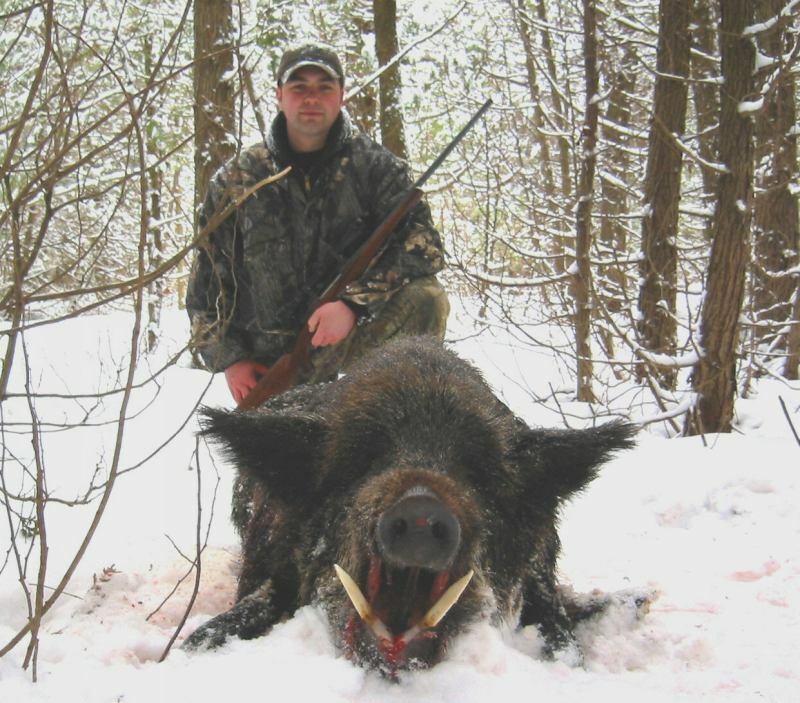 During a hunt, wild boar are unpredictable. Most keep the distance, some hide in the thick brush, while others outright charge the hunter (rarely)! Wild boar meat is delicious, lean, dark red, and low in cholesterol. A true delicacy even to the most demanding connoisseur! Come and experience the ultimate hunt in "Borassic Park", that gives a new meaning to the word "Park". Clic here to contact WildBoar Reserve !